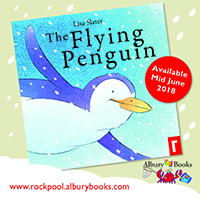 Visiting schools as a practising author, illustrator and publisher at Rockpool Children's Books, is an opportunity to share my experience and enthusiasm with children and teachers. 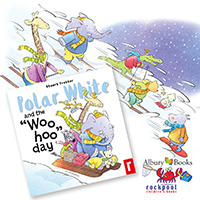 Each visit, called 'All about picture books', looks at the process of writing, illustrating, and producing a picture book. I show the children rough drawings and artworks, and then run a workshop with them to produce their own illustrated picture book. After introducing myself I then talk about Rupert Bear - this iconic character, his history and my involvement. I show the children original art, talk about the unique Rupert Bear annuals, and explain how he’s illustrated. I talk about other characters I’ve illustrated, such as Postman Pat, Wallace and Gromit, Kipper, Noddy and Winnie the Pooh, and show examples of artwork and printed books. The talk then moves onto picture books in general. I show the children the many forms of children’s picture books - board books, flap books, pop-up books, several of which they will recognise. I talk about being an author/illustrator and explain how a picture book comes about, showing original artwork and drawings in progress. Next I explain the roles of the writer, illustrator, designer and publisher, and how all these contribute to the production of a finished picture book. I read several stories, demonstrating the use of rhyme, repetition, alliteration, and onomatopoeia. We discuss ideas and imagination, and where it comes from. At this point the children can ask questions. This is followed by group brainstorming to generate illustration / story ideas and get the children thinking about their own picture book. Schools often have a topic they are covering, so I base this bit on the subject suggested. For example 'Centenary of the end of WW1', 'There's no place like home', 'Bears', 'Pirates'. I encourage them to work out their ideas on the storyboard sheet I provide, and to ‘just draw’ or write anything to get their ideas onto paper. Once everyone is happy with the story, the children then transfer their ideas, drawings, words into individual blank picture books that they are given, again supplied by me. I can do drawings on the board to demonstrate handy tips to help and hopefully inspire. I then walk around the classroom and talk to each child individually about their thoughts and ideas, helping if they’re stuck. 'All about picture books' has proved a great success with some excellent testemonials from the schools I've visited. 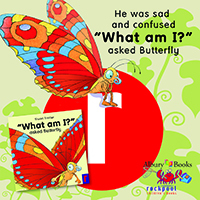 It encompasses imagination, creative writing, character creation, drawing, design, and engages reluctant readers and writers. Note. I work to the schools schedule, and generally have between 45 - 60 minutes per class. Unfortunately this isn't enough time to actually complete the picture book, but it hasn't proved a problem and children and teachers have been happy to continue the process. Some of the finished storyboards and picture books are nothing short of remarkable. Any day is perfect for a picture book day, but my visits can also bring a focus to events throughout the year – Book Weeks, World Book Day, The Big Draw etc. 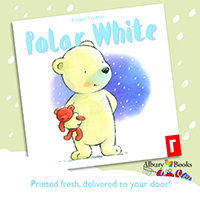 I've written, illustrated and published over 50 picture books, and I also currently write and illustrate for the Rupert Bear Annual! 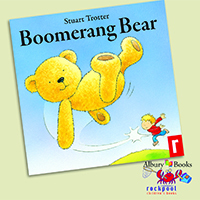 Eddy thinks he's told old for his teddy, and tries to throw him away...but, "Boomerang Bear came back!" 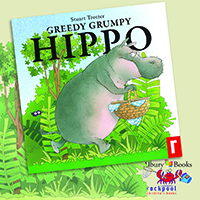 Hippo is determined to have his picnic all to himself. The other jungle animals think differently! 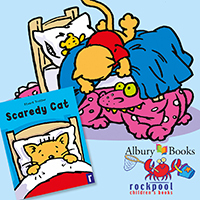 Scaredy Cat is scared of everything in this delightful rhyming picture book, but all is made good in a lovely reassuring way! 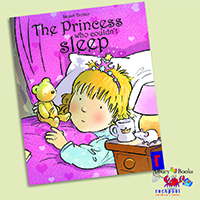 When Princess can't sleep, the Queen pulls out all the stops to try and put this right, in a way only the Queen can! 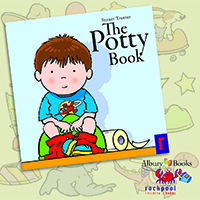 Bright colourful picture book about potties to entertain and encourage little ones during potty training. He went to bed as a caterpillar, and woke up as something else! Wings on his back, big bulgy eyes...what could he be? Would the other animals be able to tell him. A beautifully illustrated picture book. 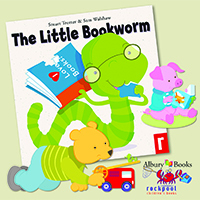 The Little Bookworm loves to eat books...all sorts of books, some delicious, some challenging! 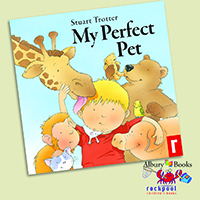 A fun children's picture book about children's books, written by Stuart Trotter and illustrated by Sam Walshaw. It's snowing! In fact it's always snowing where Polar White lives, so it's a perfect day for the beach. Join him as he and Rusky the Husky take little Ted off to the seaside for another exciting day of snowy fun. “If I am a bird,” thought penguin, “then I should be able to fly!” The water, where all his chums were, looked far too cold! “That’s where I should be, up in the air! However, being a penguin, it’s not that easy!